The AC-EX100-444-KIT-GEN2 is a revolutionary 4K60 4:4:4, HDR and 18Gbps supported HDBaseT extender over single CAT (6a recommended) UTP/STP. 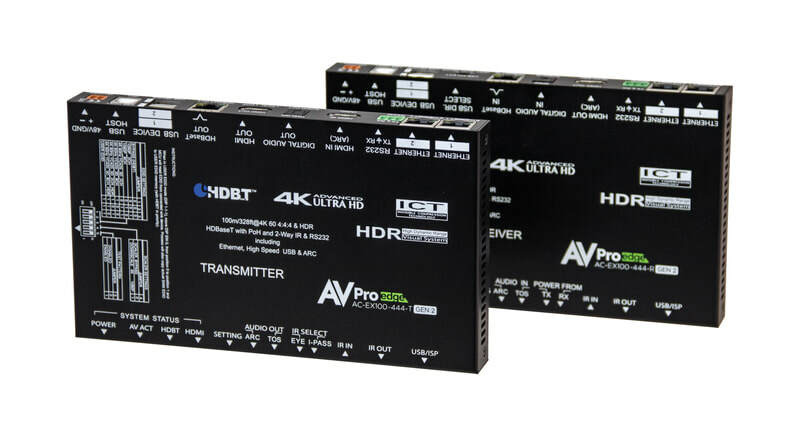 AVPro Edge presents its 18Gbps over copper extender. Using ICT (Invisible Compression Technology) we have achieved what was thought to be impossible. 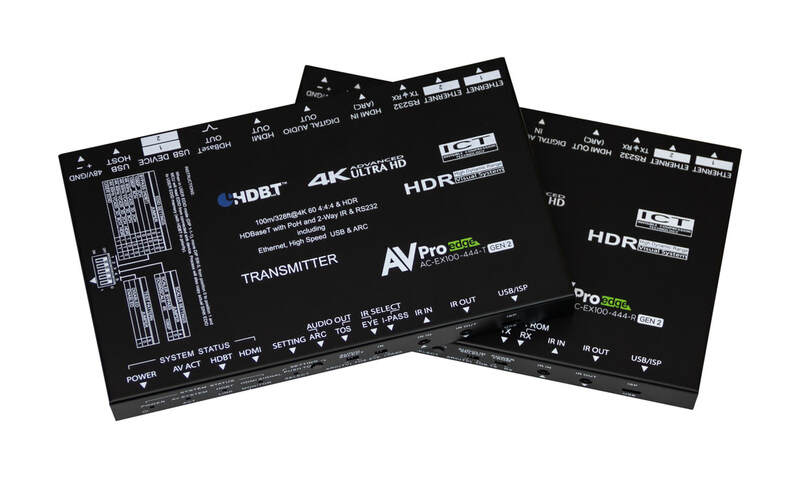 We can deliver a virtually lossless high bandwidth 4K HDR signal with support for all signals up to 18Gbps. Deep Color and HDR Metadata remain intact making the transmission free of artifacts like banding. Other similar devices will deliver a sub-par image that has very visible banding and color shifting. 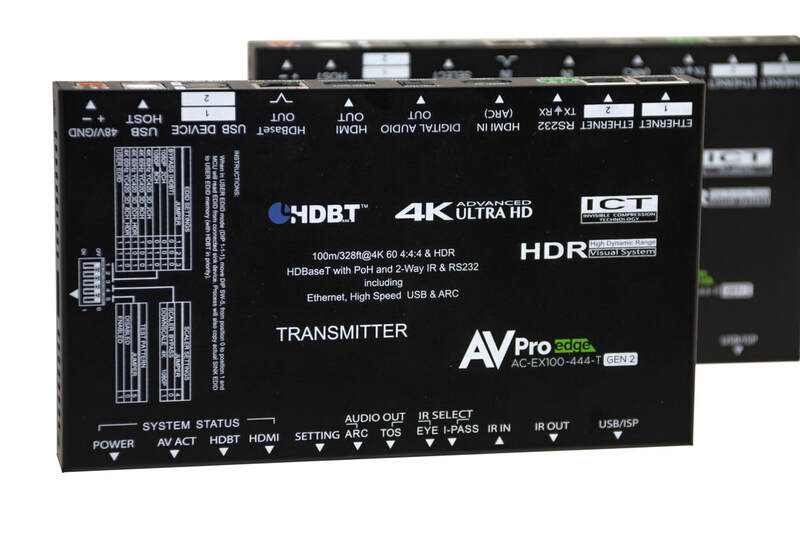 Extend 4K 60 4:4:4 and HDR Signals: The length of manufactured HDMI cable is unchangeable after it is made and they are unreliable after about 25FT. 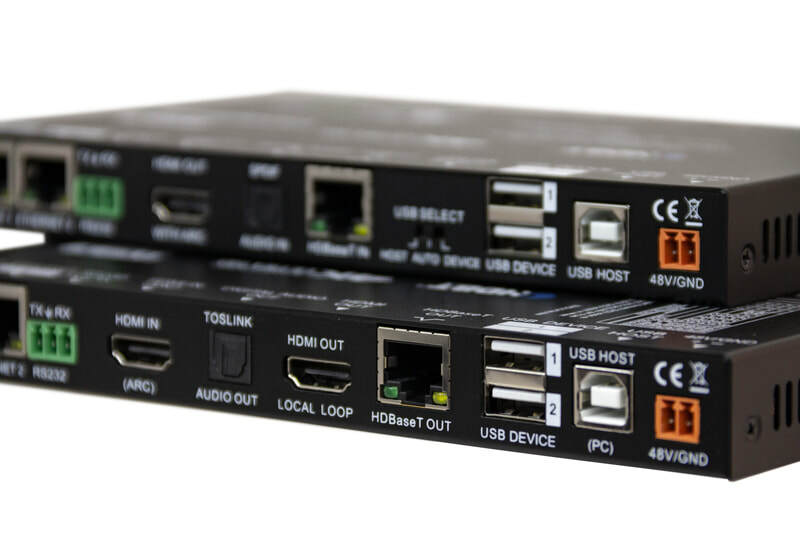 Additionally, HDMI connectors can only be terminated in specialized factory environment due to its extremely high frequencies and high density. This does not allow installers or users to remake or make cables on a DIY basis. CAT-6A cables are available widely and can be reworked easily by the installer or end-user. Additionally, using CAT cable allows the user to change components as technology changes. 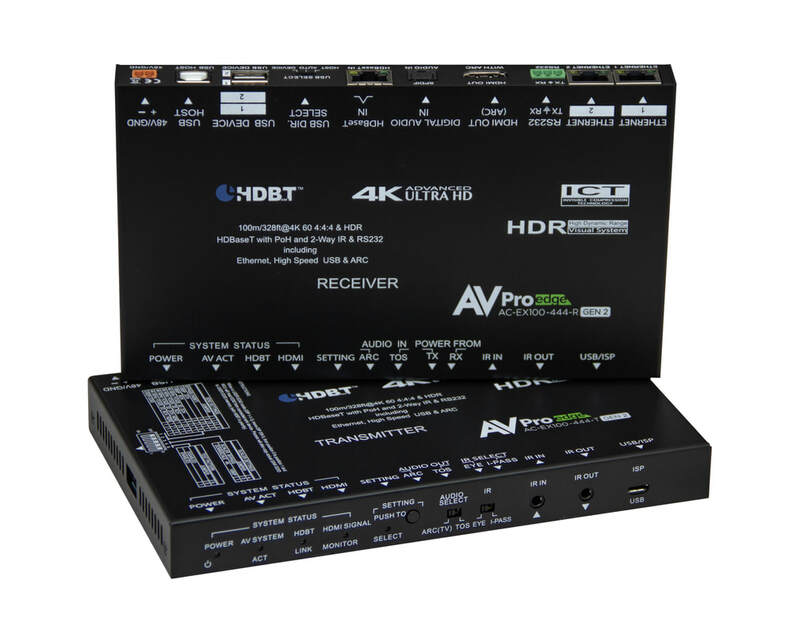 By using AC-EX100-444-KIT-GEN2, the transmission distance for HD 1080P is up to 100 meters (330’) and UHD, 4K resolution the distance reaches an impressive 70 meters (230’). 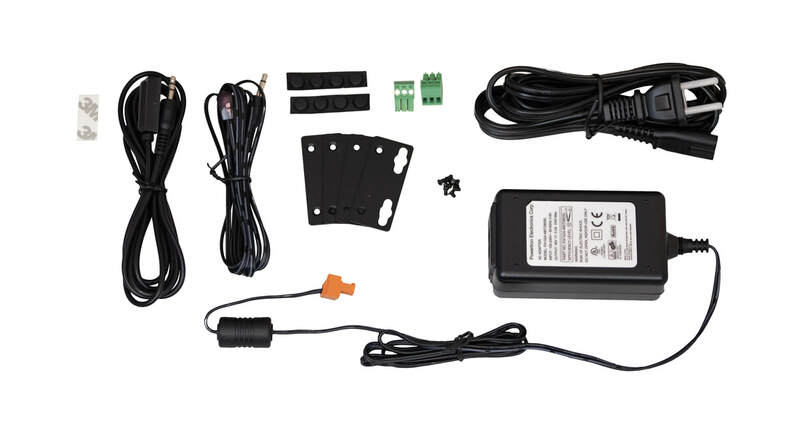 KVM (Keyboard Video Mouse): USB extension makes this unit a favored KVM solution. On the Transmitter device connect a USB A connection from a computer to the transmitter. That signal is carried along side the audio and video data on the category cable. On the receiver end you can connect your mouse or keyboard and control the computer 100 meters away. This is perfect for schools, contractors, drafting houses, constructions companies and more. Down Scaling: The AC-EX100-444-KIT-GEN2 has a scaling circuit built into the transmitter. The scaler can scale 4K (and HDR) --> 1080P. A common application for this is when you have a 4K distribution and you have one or two displays that are older. You can use the extender to scale down where you need to and not have to reduce the entire system. 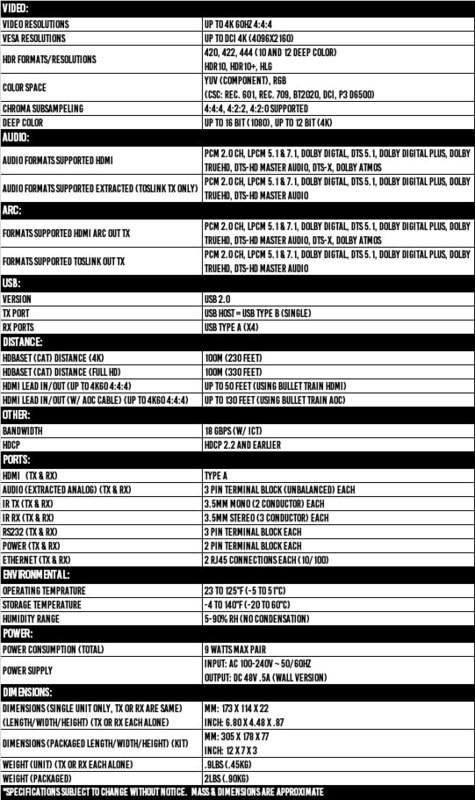 The AC-EX100-444-KIT-GEN2 does the heavy lifting, eliminating the need to add additional boxes. This is an ideal choice for extension for projects requiring an 18G matrix like the AC-MX1616-AUHD. 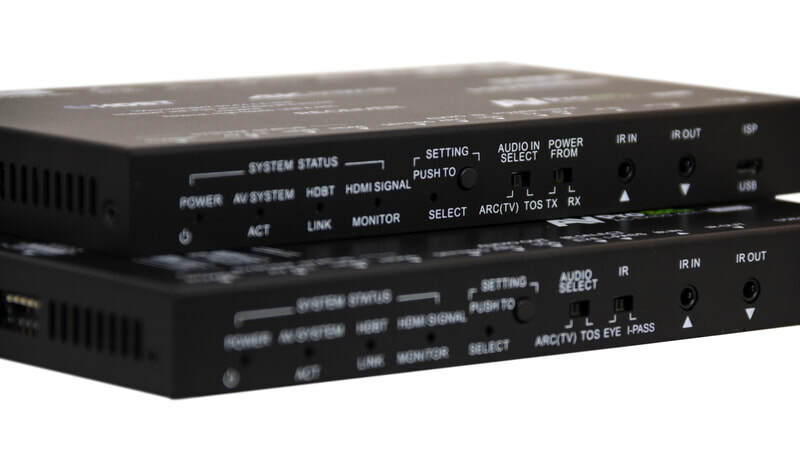 Audio Return Channel (ARC): The Audio Return Channel in HDMI 1.4 and 2.0 enables a TV, via a single HDMI cable or Toslink, to send audio data “upstream” to an A/V receiver or surround audio controller, our extender will continue the upstream audio all the way to the Transmitter. There it can be connected via HDMI ARC or Toslink. Cascade: AC-EX100-444-KIT-GEN2 features HDMI signal equalization and amplification. 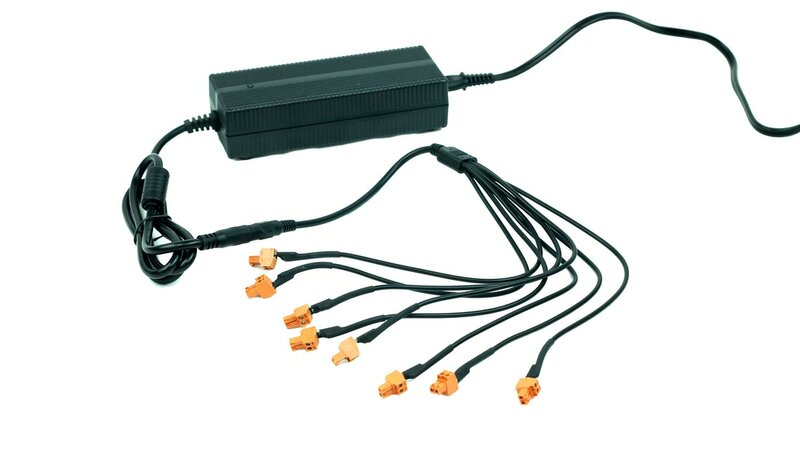 This allows for a “daisy chain” of AC-EX100-444-KIT-GEN2 extenders for extremely long distance transmission. With our unique bi-directional power, there is no need for a power source where the Rx and Tx meet up in a daisy chain, simply power the first Tx and the second Rx and power will be provided to the middle remotely. Point to point HDMI extension – flat panel in BR# 1 to STB in basement – makes for a very clean install. 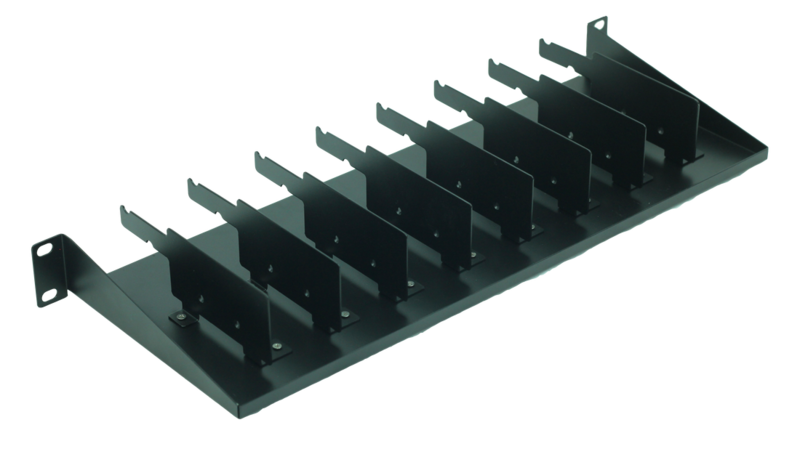 As an add-on to any matrix switch up to 18G for long distance zone coverage. For retrofit jobs where there is category cable already run and re-engineering is not an option. 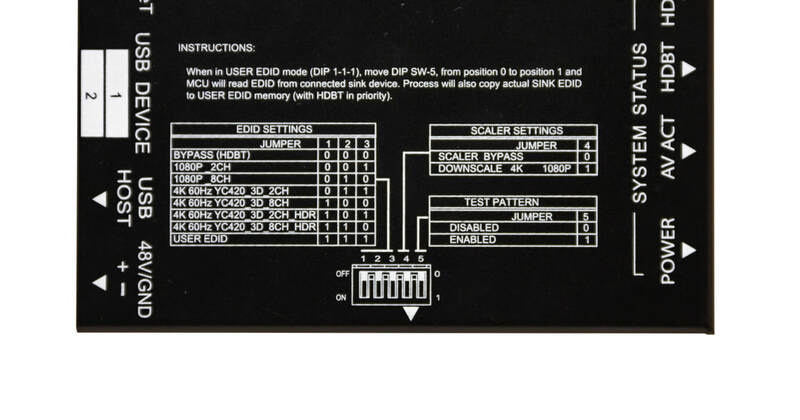 You can power 8 Rx's or Tx's with one power supply. Also mount your extenders in your rack for a clean installation.